An Ordinary Life : Science: What is Blood Made Of? Science: What is Blood Made Of? First I made a model of blood with the girls, as I went I explained what each part was and some facts about it. Here's how to put your model together and some interesting facts to learn along the way! 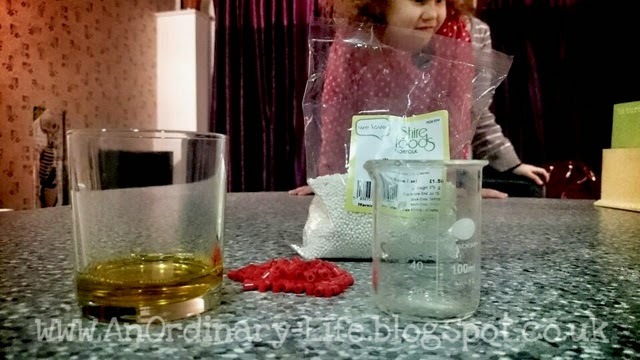 In your measuring beaker add 20ml of Hama beads. The Hama beads represent the Red blood cells in our blood. They are quite large microscopic cells with no nuclei. They are filled with haemogloblin. This is a protein that is used to carry oxygen to around the body. Haemoglobin contains iron. Haemoglobin give red blood cells their red colour as the iron and the oxygen are mixed it makes the colour red. They are really more like a doughnut shape with a indented centre as opposed to a hole but I thought the hama beads were a good representation in regards to the shapes size and colour combined. Add a small amount of cashew nuts. Two or three is enough. These cashew nuts represents the white blood cells in the blood. The reason why we add so few of them is that only about 1% of the volume of your blood is made of white blood cells. White Blood cells destroy pathogens (they do not eat them but ingest them then destroy them) Pathogens are not the disease but cause the disease. Now add quarter of a teaspoon of uncooked tapioca to your jug. This tapioca represents the platelets in your blood. Platelets are important in the body as they help to form clots to stop bleeding and help the body to repair itself. If one of your blood vessels gets damaged it sends out signals. These signals are picked up by the platelets that quickly rush to that area and form a plug or a clot to repair the area. Platelets are produced from very large bone marrow cells called Megakaryocytes. Platelets actually come in a variety of colours. Another name for Platelets is thromocytes. A normal Platelet count is 150000 - 450000 platelets per micro-litre of blood. Under a microscope a platelet looks like a tiny plate. Platelets are what form scabs. 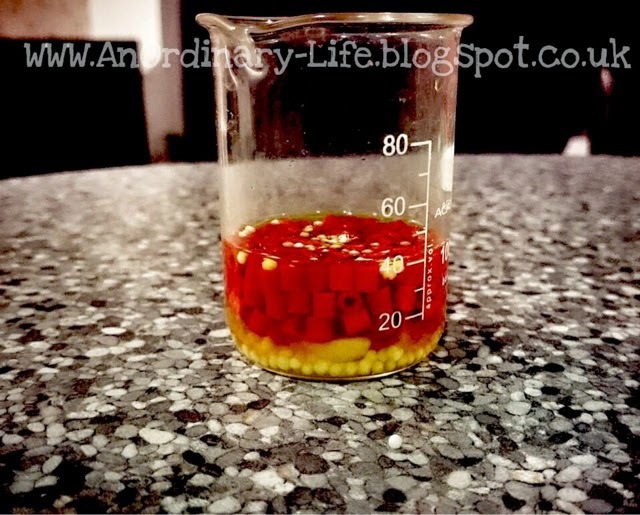 Now add 20ml of water dyed with a drop or two of your yellow food colouring to your measuring jug. This yellow liquid represents the plasma in your blood. Plasma, when separated from the rest of the contents of blood, is a straw-yellow coloured liquid in which the blood cells and the platelets float in. Plasma has a very important job as it carries the three important cells for blood clotting - red blood cells, white blood cells and platelets - throughout the body. Along with water, plasma also carries salts and enzymes too. Plasma's primary job is to transport nutrients, hormones and proteins to the parts of the body that needs it. Cells deposit waste products into the plasma, which the plasma then helps remove from the body. If you want you could use some play dough and make a more precise shape of a red blood cell, White Blood cell, Platelet and Plasma. that's really good - your girls are all ready to IGCSE Biology now! I get confused with all the -cytes parts of the white blood cells. Some books say phagocytes and lymphocytes and other give different names and you have a whole lot more! I brew my own beer and when I was emptying the fermentation bucket the other night I showed Ben the extra amount of yeast left from that I put in so he saw it was alive and reproducing. I put some on a slide and looked under microscope (do you have one?) but found there were far too many cells so diluted it down and added blue stain and they came out really well. Ben wanted to see them alive but these were not reproducing so I imagine there were the dead or spent cells.